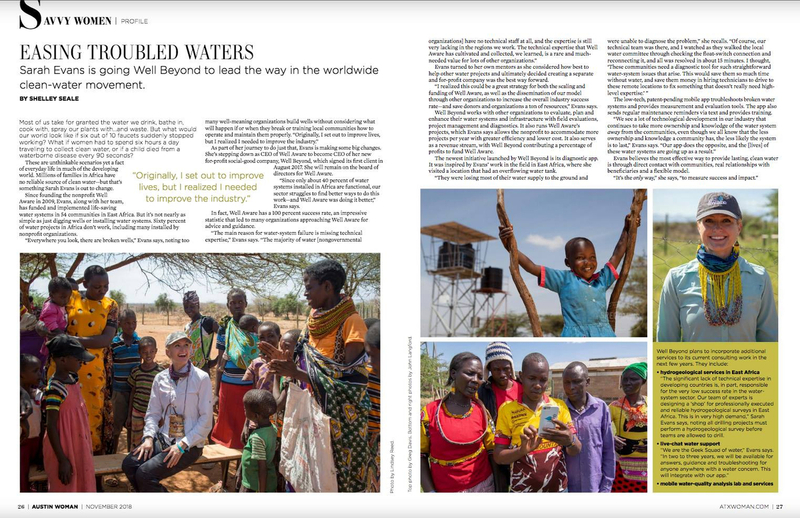 Sarah Evans is going Well Beyond to lead the way in the worldwide clean-water movement. Most of us take for granted the water we drink, bathe in, cook with, spray our plants with…and waste. But what would our world look like if six out of 10 faucets suddenly stopped working? What if women had to spend six hours a day traveling to collect clean water, or if a child died from a waterborne disease every 90 seconds? These are unthinkable scenarios yet a fact of everyday life in much of the developing world. 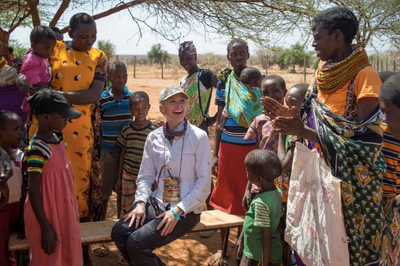 Millions of families in Africa have no reliable source of clean water—but that’s something Sarah Evans is out to change. 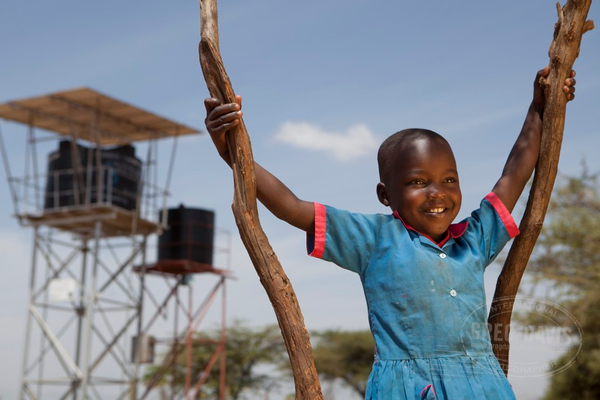 Since founding the nonprofit Well Aware in 2009, Evans, along with her team, has funded and implemented life-saving water systems in 54 communities in East Africa. But it’s not nearly as simple as just digging wells or installing water systems. Sixty percent of water projects in Africa don’t work, including many installed by nonprofit organizations. “Everywhere you look, there are broken wells,” Evans says, noting too many well-meaning organizations build wells without considering what will happen if or when they break or training local communities how to operate and maintain them properly. As part of her journey to do just that, Evans is making some big changes. She’s stepping down as CEO of Well Aware to become CEO of her new for-profit social-good company, Well Beyond, which signed its first client in August 2017. She will remain on the board of directors for Well Aware. “Since only about 40 percent of water systems installed in Africa are functional, our sector struggles to find better ways to do this work—and Well Aware was doing it better,” Evans says. In fact, Well Aware has a 100 percent success rate, an impressive statistic that led to many organizations approaching Well Aware for advice and guidance. Evans turned to her own mentors as she considered how best to help other water projects and ultimately decided creating a separate and for-profit company was the best way forward. “I realized this could be a great strategy for both the scaling and funding of Well Aware, as well as the dissemination of our model through other organizations to increase the overall industry success rate—and save donors and organizations a ton of resources,” Evans says. 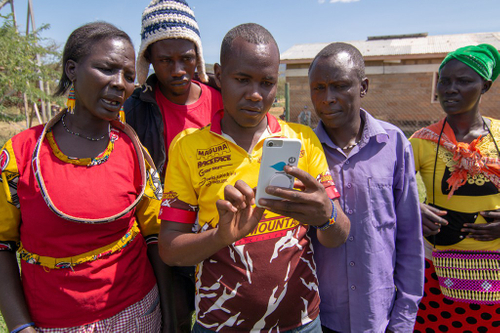 The low-tech, patent-pending mobile app troubleshoots broken water systems and provides measurement and evaluation tools. The app also sends regular maintenance reminders via text and provides training. Evans believes the most effective way to provide lasting, clean water is through direct contact with communities, real relationships with beneficiaries and a flexible model. designing a ‘shop’ for professionally executed and reliable hydrogeological surveys in East Africa. This is in very high demand,” Sarah Evans says, noting all drilling projects must perform a hydrogeological survey before teams are allowed to drill. live-chat water support: “We are the Geek Squad of water,” Evans says. “In two to three years, we will be available for answers, guidance and troubleshooting for anyone anywhere with a water concern. This will integrate with our app. See the full digital article here.